The language botanists use can be off putting for those trying to get to grips with the subject- even the very best texts on the subject require diligent study (my edition of Stern’s Botanical Latin is never far away) but once you do start to learn the basics, the whole world starts to make a bit more sense. The first landscape architect I worked for told me that the first hundred plants would be the hardest to learn: the next thousand would be easy. I was sceptical at the time but it seems to make sense. 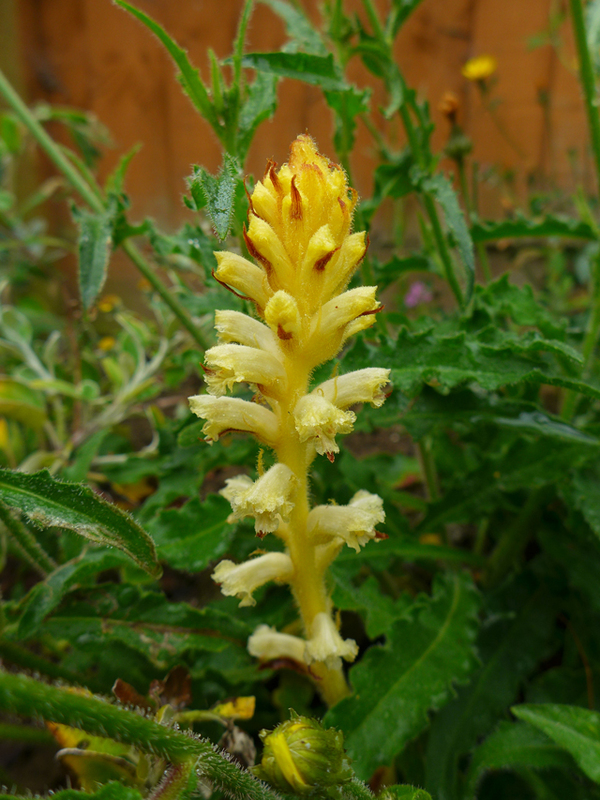 This month I’ve been trying to study Orobanche, known as broomrapes, a genus of holoparasites, meaning that they directly parasitise the roots or shoots of other species and bringing with it a whole new vocabulary. Perhaps they aren’t widely celebrated because of their ghostly appearance (or perhaps because they’re vanishingly rare and extremely difficult to cultivate) but either way they tell us huge amounts about plant interactions and communities and are fascinating to look at. One of the intriguing aspects about them is how rare they are given the prevalence of their hosts. We see clovers, ivy, thistles growing everywhere but not necessarily the parasite broomrape: I can only conclude that they are highly specific in their demands. Because they are parasites, they do not need chlorophyll and don’t even have true leaves or roots- because of this they have been extremely difficult for botanists to classify and it is only now that DNA sequencing is possible that the Orobanche genus is being systematised. Orobanche minor is relatively common, parasitising clovers, however, many rare variants exist and are threatened with extinction. Orobanche minor var. 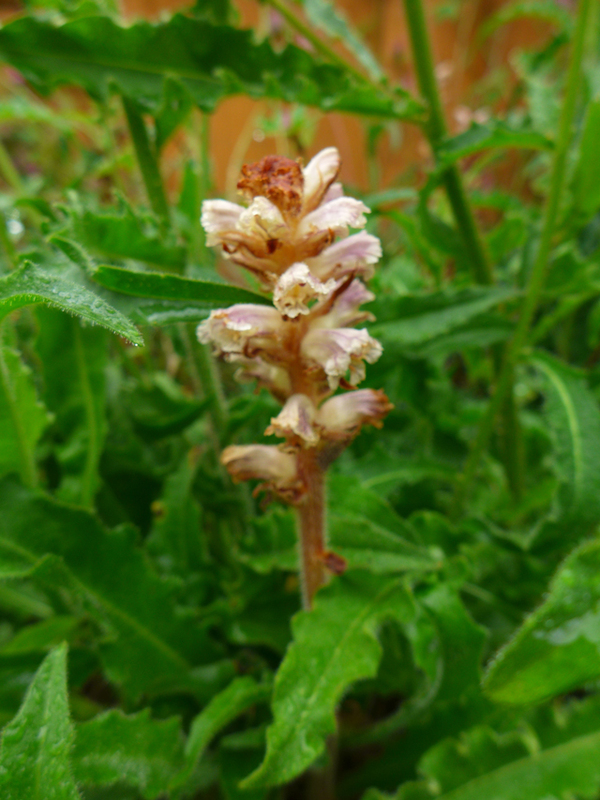 flava grows only in one location, whilst the thistle broomrape (Orobanche reticulata) has only three known locations, all in Yorkshire. That said, sometimes you see plants where you least expect them, such as this Orobanche hederae (Ivy broomrape) that I saw on the way back from the pub in Bristol. 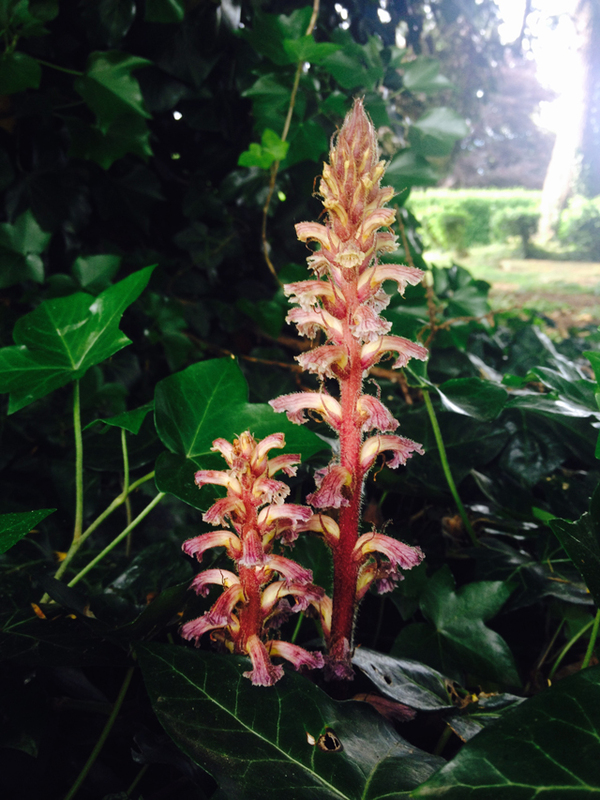 Interestingly, research at Bristol Botanic Garden has shown that broomrape that grow on Brachyglottis (a favourite of landscape architects in supermarket designs) are genetically distinct, meaning that these plants are in the process of forming a new species on different hosts. It seems that our understanding of Orobanchaceae is just beginning.